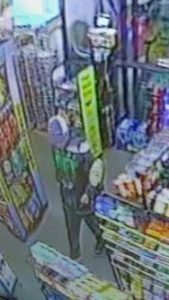 On Tuesday, May 1, 2018 at 8:13 p.m., troopers responded to the Dollar General Store, 401 Conowingo Road., Conowingo, regarding a robbery. 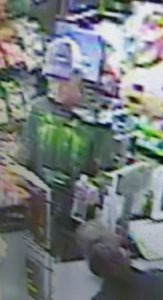 A white male suspect entered the store and demanded an undisclosed amount of currency and left the store on foot. The suspect is described as a white male, mid-20’s, approx., 5’4”, 125-140lbs, dark hair, hazel eyes, dark brown stubble, wearing a black and green printed “Monster” hooded sweatshirt, blue and white ball cap, dark pants and dark sneakers with white soles.